A preacher’s struggle with his homosexuality, church, and faith. There comes a time when we have to face realities in life. For some, reality slaps them in the face, refusing to be ignored. 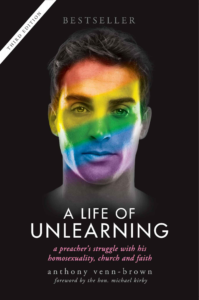 As Anthony’s story is ultimately about being true to one’s self: whether you’re gay or straight, religious or non believer, you’ll find relevance in this triumphant autobiography. A Life of Unlearning (3rd edition) paperback is available through all major online booksellers such as Amazon, Barnes and Noble, The Book Depository, Alibri, Angus & Robertson, Fishpond, Booktopia etc. Or order from your local bookstore. ISBN-13: 978-0994152411 ISBN-10: 0994152418. I was privileged to hear Anthony Venn-Brown speak at the Leadership Training Academy in Melbourne recently and intrigued to read his book ‘A Life of Unlearning’. I simply couldn’t put it down. Anthony is a born storyteller and I was so moved by his recollections of growing up in Australia, and heartbroken at times when the conflicts of his faith and sexuality had such profound impacts on his life, and those close to him. I felt like I was there with Anthony as he wrote of his life in the army, ministering around the country, his tough times and eventually finding peace. Anthony writes of his beloved family with such love and respect and I thank goodness that for many, coming out is much more accepting these days as a result of the courage of Anthony and other LGBTIQA+ activists and allies.